Dogs are man’s best friend but also one of his most tedious metaphors. Filmmakers like to use them to rhyme with human aggression, while showing that a creature’s propensity for violence comes down to how they are treated; Jeremy Saulnier used a wandering pit bull in the final act of this year’s “Green Room” to great effect, showing the soft side of an animal seen earlier in the film as a throat-ripping soldier. 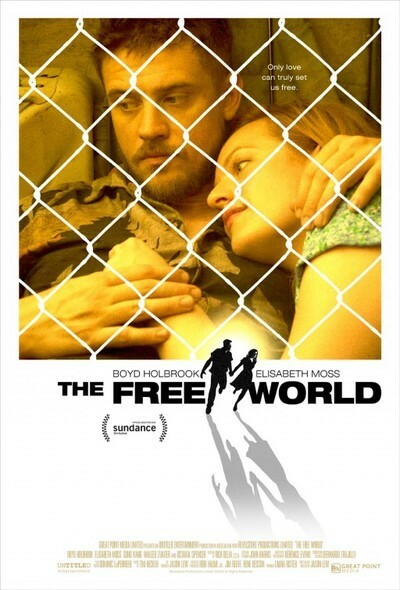 But unfortunately, dog metaphors prove to be only one of writer/director Jason Lew’s problems, as his debut “The Free World” is riddled with more than a few unfortunate directorial choices. We learn about Mo's past, which is curious on paper. He was known as “Cyclops” in prison, but has since found peace in Islam (he refers to himself as Mohammed) and lives alone. Said past does come up to haunt him when he provides shelter to Doris (Elisabeth Moss), who has murdered her abusive husband, a smug, macho cop. It’s directly hinted that her husband is abusive from an earlier scene, in which the couple came to the shelter with her bloodied dog, Charlie, that he proudly beat up. The first extended scene between the two is a revealing example. She wakes in his apartment after she passed out in his shelter a day earlier, with blood on his hands. Unsure of where she is or what he may have done to her, she tries to attack him, with the visceral psychological terror of a horror movie. He is able to peacefully let her know that he did no harm. But you can almost time it as to when the energy from this moment disappears, especially as lifeless blocking is divided with a dull shot-reverse-shot exchange, with empty beats wedged between them. In spite of what the performances offer in this moment, the filmmaking has no energy of its own. This altercation ends with Moss hiding inside a dog carrier when the police show up, in case you missed the captivity symbolism from earlier. Though there is a lot of movie after this scene, the rest of it takes on the same exact spirit of this moment—Mo tries to protect Doris, while trying to avoid the police. Stubborn with the dog idea, when Mo is later intensely interviewed by a detective (Sung Kang) at the shelter, Lew uses crescendoing dog barking in his sound design. When Mo and Doris finally ditch town, and the damn dog metaphors, the story’s initial motivations receive no better poetry. Mo’s inner beast is awoken, and Doris becomes a damsel in distress. Holbrook and Moss have something within their respective performances that would work if the movie did not feel so alternately over- or undercooked. The sluggish pacing and the often dark lighting of their emotionally revealing conversations yearn for some importance, but the film’s clunky execution says otherwise. There is no tension as they bond or are being pursued; in spite of the time spent with these characters, they do not exist beyond archetypes. Foiled by its empty poetry, “The Free World” squanders its potential to richly explore the human aspects of its curious creatures.